I love all food that comes from around the Mediterranean: paella, cassoulet, dolmades, hummus, tagines… The list goes on. But I have to say that my true passion is for all things Italian. I fell in love with the country as a small child. There was something so romantic about the language, the art, the architecture and the food. I have absolutely no idea where this came from. When I was growing up, my family tended to holiday, in the early years, in northern France and later, further south in the Quercy region. I remember one holiday in the Algarve in Portugal, another in the south of Spain and another in Malta. But we never went to Italy. It can’t have been as popular as a package holiday destination back then. My passion for it was so strong that I started to teach myself Italian when I was about 18 and took it as an extra subject in my first year at university. By the end of the year, I had dropped the French component of my degree (I really struggled to get to grips with Racine and Molière) and taken up Italian in its place. I had committed myself to spending the third year of my degree somewhere, as yet undecided, in a country where I had never been and where I was still, really, only able to speak a smattering of the language. A real leap of faith. But my year in Florence was to be the best of my (unmarried) life and I have to say that the food was not an insignificant part of this. One of the saddest things I felt, when I realised that I was gluten intolerant, was that I would no longer be able to enjoy Italy in the same way that I had before. It’s the home of pizza, pasta and focaccia, right? It is, but it also happens to be a country where everyone is routinely tested for coeliac disease. Hence the supermarkets have a wide array of gluten-free goodies, processed food doesn’t seem to be automatically stuffed with wheat and barley to make it cheaper and go further and when you explain in a shop or restaurant that you can’t eat gluten, you’re not immediately greeted by a raised eyebrow and a sneer which clearly says “You’re not another one of those faddy eaters, are you?!?”. 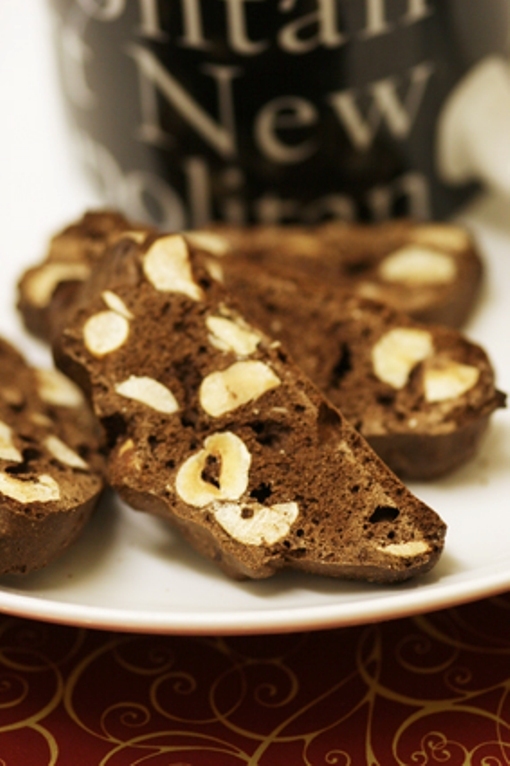 I used to love dipping biscotti into frothing cappuccini but needless to say, I haven’t had any in nearly two years. I thought it was about time. And now that we’re in December and on the home stretch towards Christmas, chocolate, orange and hazelnuts seemed the perfect festive touch. These biscotti aren’t massively heavy on the sugar (my philosophy is the less sickly something is, the more of it you can eat! ), but if you’re a bit of a sweet-tooth, you might want to add a little more. Preheat the oven to 180°C (350°F). Line two baking sheets with baking parchment. In a bowl, sift the flour, cornflour, cocoa powder, caster sugar, baking powder and xanthan gum. Stir in the hazelnuts and orange zest. Make a well in the centre and fold in the egg and vanilla essence to make a sticky batter. Spoon onto one of the baking sheets to make two rectangular logs, about 25cm long by 5cm wide (normal raw biscotti mixture is like a sticky dough which you can roll into the log-shapes but this is more like a cake batter). Make sure you leave space in between them to allow for spreading. Bake in the oven for 30 minutes, then remove from the oven and allow to cool. The loaves are easy to remove from the baking parchment with a palette knife and place on a wire cooling rack. Reduce the oven temperature to 140°C (275°F). Cut each loaf into thin slices (about 5mm wide), using a sharp bread knife. Spread the biscuits out over both the baking trays (I use fresh baking parchment on the tray I’ve already used) and bake for a further 20 minutes, turning them halfway through. Remove from the oven and place on wire cooling racks.